Hi, I am interested in your 1932 Ford Other Ford Models (stock #1725-TPA) listed on Autotrader for $48,995. I'd like to get more information about this vehicle and confirm its availability. 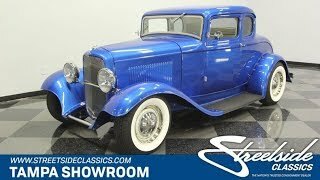 With a slick appearance, a mean V8, and full custom A/C interior this 1932 Ford 5-window coupe just seems know how to perfectly blend classic style and hot rod elegance. The 32 is a legendary design that makes a great custom street machine. But it takes a careful eye to create something as distinguished as this one. The body is a quality fiberglass setup from New Age Motorsports. So you get a crisp and tight fit thats also supported by the right steel components, like the hood, running boards, and flowing genders. Its all finished in a terrific shade of Adriatic Blue that has a deep luster and hint of metallic. So it does a terrific job of highlighting all the curves the moment the sunshine hits the body. But what we love best about this one is how it does a great job of blending vintage style with plenty of performance flair. For example, you get classic touches like the double-hump rear bumper, whitewall tires, and classic Ford V8 hubcaps. But with three inches chopped from the body and that ultra clean front end, this instantly announces its a special custom. Even the details are great, right down to the blue pinstriping within the white wheels. All the white accenting of the exterior gets you ready for the interior. This bright white looks terrific on the doors, dash, seat, and headliner. And this is supplemented by everywhere, including the carpeting and the cool steering wheel. So you get a great uniform two-tone look inside and out. More than just look great, this coupe was built for comfort. Thats why you have great upgrades like a tilt steering column, Lokar shifter, backlit AutoMeter gauges, and a cleanly installed retro-style AM/FM radio. The front windshield tilts open and the rear window rolls down, so you can get cool vintage-style breezes flowing through the interior. But any time thats not enough, theres modern R134a air conditioning to ensure you always feel as cool as you look behind the wheel. The butterfly hood opens wide so everyone can get a good look at this cool motor. Youll love showing off this detailed presentation with the clean white engine bay, bright components, crisp wires/hoses, and ribbed valve covers with matching exhaust manifolds. More than just show-worthy, this 350 cubic-inch V8 was built to run. It has a Demon four-barrel carburetor, Edelbrock performer intake, and sweet-sounding dual exhaust. It even has the right supporting components, like an aluminum radiator w/electric fan. As you look at the color-matched undercarriage, you can see this is the kind of car that youll put a mirror under at the shows. Plus, youll also see great driving upgrades, like the Heidts Superride front end w/adjustable coilovers, strong Currie 9-inch rear end with a limited-slip differential, front disc brakes, a three-speed automatic transmission, and Flaming River rack & pinion power steering. Even those cool classic whitewalls are masking a modern tread for a great feeling on the road. Complete with build receipts, this is the ideal 32 Ford built for show and go. So if you love the best of everything, dont miss this coupe. Call today!! !